There are thousands of sewage lagoons in North America that have been lined with PVC geomembranes over the past 40 years. These sewage lagoons allow sewage (or other waste water) to degrade over a specified retention period before being released. 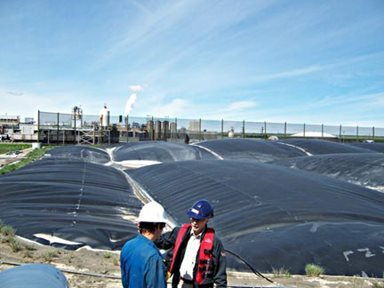 Our featured products for sewage lagoon applications are our new REVOC Biogas collection covers, REVOC Insulated covers (to retain heat), and our REVOC Algae Control cover (to prevent algae buildup). We also feature floating baffle curtains to help prevent shortcutting in ponds. All of these new products add to our complete line of geomembranes for all sewage and wastewater containment applications.